Does your child dread the dentist chair? If you live in Georgia, there’s probably a good reason for that. Sweets abound in Peach State diets, everything from homemade baked goods and candy to sweet homegrown peaches and other produce. That’s why ensuring your child gets proper dental care is so important, and finding one that caters specifically to children is your best bet. If you’re lucky, your child may even get excited about a trip to the dentist when you head to one of these 10 best kid-friendly dentists in Georgia. Even playgrounds don’t get any more kid friendly that Children’s Dental Zone. This place was made with young patients in mind, everything from decor and entertainment to gentle dental procedures. Kids won’t be able to protest the fun environment and energetic staff that ensure your child gets a good experience in every visit. The folks here know that good oral hygiene begins well before the first tooth emerges. That’s why they’re dedicated solely to helping young patients develop good habits early for dental health that will last a lifetime. With two locations, this dental practice knows how to get your kids excited about brushing and flossing! Even more important than giving your child the dental care he or she needs is ensuring their comfort and safety during the process. At least, that’s the motto at Turner Pediatric Dentistry. They’ve specially designed their entire practice for age-appropriate needs, from chairs and equipment to decor and procedures. With multiple offices in the greater Atlanta area, this dental practice offers all the services your child needs to correct or prevent issues and maintain their gorgeous smile. Every office is equipped with kid-friendly practices, caring staff, and a variety of services to offer tailored dental care to every child. 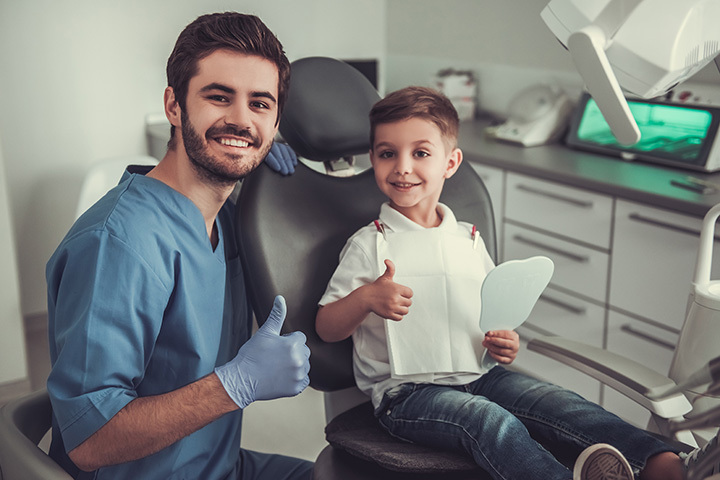 Specializing in both pediatric and special needs dentistry, your child will be eager for their next trip to the dentist when you bring them here. Surfside Kids makes dental hygiene fun. Their festive environment is complete with TVs and Bluetooth headsets to make their time in office fly by. If you’ve never been to a dental office that doubles as a movie house and video game arcade, you’ll want to come here for the sightseeing alone. This state-of-the-art facility offers some of the best dental care in the state, administered by people who treat every patient like family. They focus on education during every visit, as well as helping kids learn how to prevent dental issues with routine maintenance at home and in the office. Oral health is part of a child’s overall wellbeing, and nobody knows this better than the folks at Apple Tree Pediatric Dentistry. They not only provide routine care in the office, but also plenty of education to help your child build good habits in between visits. They’re also specially trained to treat children with special needs to give every child the healthy smile they deserve. If you thought fun dentistry only existed in a fairy tale, get ready to step into the magical wonderland known as Park Pediatric Dentistry. An environment perfectly suited for a happy ending, your child will love the comfort, calming techniques, fun atmosphere, and attentive employees that make every experience unique and memorable. Olivia was such a big girl at her dental check up. She even let them take x-rays! With two locations (the other is in Macon), kids ages one to 18 get excited about their dental visits. The staff has a lot to do with that, making each child feel welcome and helping to reduce their anxiety. Fun bright colors are throughout the office to create an inviting place for children to learn about their teeth. The only thing better than North Georgia Pediatric Dentistry is the fact that they have two locations to serve their patients in the best possible way. Kids of all ages get excited about their visits here because they feel like they’re among friends every time. Every patient learns how to care for their own teeth in between visits to give them the best chance of keeping their beautiful smile healthy.